Picture having audiences around the world riveted by your plot, swept away by the suspense, humor, drama and intense sentiments. When you want your audience immersed in the film experience you created, you can’t let a bad translation or mismatched dubbing pull them away from what’s happening on the screen. At CMI, our team of native-language speakers and talented directors, and exacting post-production experts will preserve the authentic experience of your film for audiences in more than 150 languages. That’s because we do more than translate the language. The process starts with close attention to the regional variations in dialect and idiomatic variations in more than 150 languages, from Albanian to Zulu. Once we have the perfected script and voice-overs, we align the translation to the on-screen experience, managing multiple voices and tracks with precision, even matching syllable counts to mouth movements. That’s how we can guarantee that our captioning, subtitling, and dubbing never distracts your audience with a disconnect in the message or the timing of the words. And it’s why we’re a trusted partner for films as complex as feature-length, action-packed blockbusters from major Hollywood studios such as Comcast NBC Universal, and Sony Pictures Entertainment. We’ve provided the localization and delivery of their in-flight entertainment for more than 50 years. Just think what we can do for you. 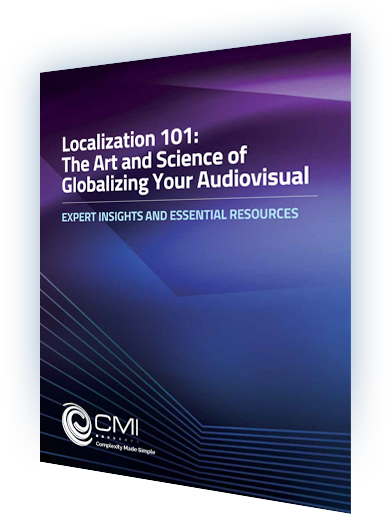 At CMI, we’ll deliver the authentic film experience you created to audiences around the world, even if you don’t speak their language. Our directors, editors and technical team will ensure a seamless experience for your target audience, with your original message preserved and delivered with it’s full impact, as intended.